The Global Tactile Sensor Market has recorded $8204.9 m in 2017 and it is estimated to surpass $16,083.8 m by 2023 growing at an estimated rate of more than 11.9% during 2018 to 2023. Capacitive Sensing is the dominant type where it witnesses the revenue of $5283 million in 2017 and estimated to reach $12,652.5 million during forecast period with a CAGR of 15.7%. Global Automotive Tactile Sensors generated a revenue of $805.3 million and estimated to grow with a higher CAGR. Market Value in Germany records $741.62 million in 2017. What is Tactile Sensor Market? Tactile sensor is illustrated as an appliance which measures the information emerging from physical and mechanical interaction with its environment. The tactile pressure sensors will circulate over a surface to sense various ranges of stimuli from detecting the presence or absence of a grasped object to extreme tactile image. Basically, tactile sensor consists an array of touch sensitive sites where it may be capable of measuring more than one holding. They empower the technical systems with the potentiality to detect and dimensionally resolve contact and pressure distributions. Tactile sensor systems are involved and equipped into assistance systems, machines and robots in medical, manufacturing, household sectors, healthcare with pressure sensitive surfaces. This report incorporates an in-depth assessment of Tactile Sensor Market by Type, Industry Vertical and Geography. What are the major applications for Tactile Sensor Market? The various end-users assessed includes Automotive, Industrial, Consumer Electronics, Aerospace, Oil & Gas and Medical. Capacitive proximity switches are largely used in automobile control applications in place of mechanical switches because of low cost and modern design which indicates that the automotive sector leads the market in usage. Sensors have been embedded into some of the most novel and advanced medical device and consumer device products in the market. Tactile sensor clothing is an interactive interface like artificial skin in robotics for health monitoring, medicine and sports. The technology shows an electrical impedance tomography technique to estimate the changes of resistance distribution on the sensor caused by fingertip contact. It is predicted that there will be tremendous growth for these types of robots in future. Companies are evolving with this new technologies such as developments in automotive applications involve in large investments for the better world. The elastomeric sensor sticky substance fixes to the surface topography which reveals full details about surface features disregarding the light conditions or material reflectivity. The surface detail is shown on contact, giving continuous visual feedback. It reduces scrap and non-quality costs which in turn decreases capital need for inventory. This develops the productivity throughout for high-cost parts and improves the safety and security in reducing operational costs. Aerospace sector has been rising as they are indulged more to get the information within seconds after capturing the object. Increasing interest in safety concerns where the tactile sensing is remarkable with their technologies. Advancement emerges to set up touch based sensors to replace traditional remote or buttons usage. Mainly, these will reduce accidents and as well as improve driver’s concentration while driving. These changes involves maintenance, conformability, system integration, reliability, robustness with the effective use of materials. Many enterprises are influenced towards this technology and companies such as Cirque Corporation, Tekscan	are planning for long-term investments. 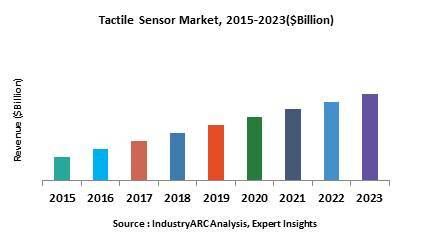 Who are the Major Players in Tactile Sensor market? The companies referred to the market research report includes Cirque Corporation, Tekscan, Inc., Synaptics Incorporated, Tacterion GmbH, Touch International Inc., Airmar Technology Corporation, Weiss Robotics, Pressure Profile Systems, Romheld, Barrett Technology and more than 20 companies.